January 11th, 2012, marks 10 years since the U.S. government first opened the doors to Guantanamo Bay Detention Center, where the U.S. has held up to 775 detainees without charges or trial. Ensnared in the U.S. government’s so called war on terror, which is in reality a war for empire, most of these detainees were held on erroneous claims that they were terrorists and were subjected to torture. Today 170 remain. 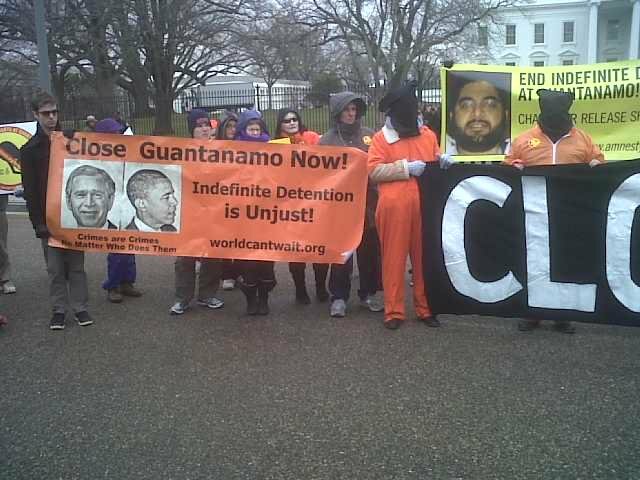 Some have been cleared for release but Obama, having broken his campaign promise to close Guantanamo, will not free them. A similar and possibly more horrific situation is occurring at Bagram detention center in Afghanistan where over 2000 people are being held without charge or trial. We cannot allow this to continue and we cannot leave our conscience in the hands of elected officials who just this week passed the National Defense Authorization Act, which essentially gives the military the right to detain U.S. citizens here without charges or trial. Obama has signed this into law. If we let this stand, our government could detain indefinitely people who it deems a threat to national security, without charges or trial. Now more than ever, we the people of conscience must step forward in a mass and visible way to demand NO MORE INDEFINITE DETENTION AND TORTURE! SHUT DOWN GUANTANAMO, SHUT DOWN BAGRAM!!! We must not be silent in the face of this injustice. Here in Chicago we have planned events to give voice to this sentiment and to those being detained who cannot speak for themselves. We invite you, as people of conscience, to join us. Jan 7: All Day Teach-In, Grace Place, 637 S. Dearborn, Chicago. World Can’t Wait, Witness Against Torture, and others are organizing the teach-in, registration begins at 8:30 am, teach-in 9 am to 5 pm. 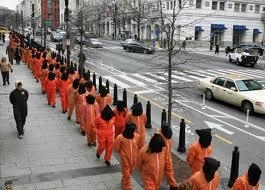 Jan. 11 the 10th anniversary of Guantanamo. We will meet at 3 pm in Federal Plaza (Dearborn and Adams) for rally, march and human chain. Wear Orange. We will be asking people to join the human chain wearing orange jumpsuits to represent those still being held at Guantanamo Bay Detention Center and Bagram Detention Center in Afghanistan. The Jan 11 action in Chicago is sponsored by Chicago WCW, Witness against Torture, 8th Day Center for Justice, the Midwest Anti-War Mobilization, Christian Peacemaker Teams, and Amnesty International. Sign up to join the Chicago Protest here https://www.facebook.com/events/260772923981745/ or email us at Chicago@worldcantwait.org to let us know you’re joining us.